Strong activation of the AhR can lead to various toxic effects such as (non-genotoxic) carcinogenicity. Moreover, drug–drug interactions by non- or competitive inhibition of CYP1A1 and 1A2 may cause adverse side effects. 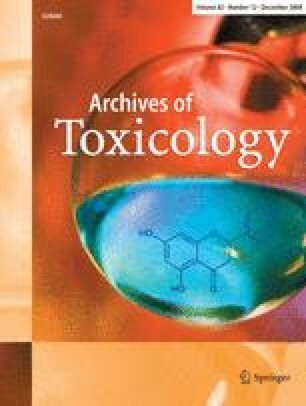 Normally the majority of toxicity studies are performed in rats, while for the prediction of human toxicity human AhR activation and CYP1A competition should be studied. The present study focused on the deselection of strong AhR activators and/or CYP1A inducers and (non-)competitive inhibitors in the early phase of drug development, as well as on species differences between humans and rats. Induction studies were performed in the human HepG2 and rat H4IIE cell lines. A set of 119 compounds, including known AhR ligands were tested. CYP1A induction was observed for 24 compounds. In H4IIE cells, more compounds showed induction and most EC50 values were below those of HepG2 cells. Species specific CYP1A induction in H4IIE and HepG2 cells was obtained for eight and three compounds, respectively. The same compounds except four in-house NCEs were used to study differences between CYP1A1 and 1A2 competition in human and rat supersomes. Of the 115 compounds 46 showed CYP1A1 competition. Competition was human and rat specific for 12 and 10 compounds, respectively. CYP1A2 competition was observed for 37 compounds of which 14 and 3 compounds showed human and rat specific inhibition, respectively. In conclusion, for several compounds species differences between CYP1A induction and competition in human and rat were found. Therefore, parallel screening in both species might be a very useful strategy.